There was a story in The Southeast Missourian that plans are in place to finish restoration of the Bald Knob Cross. I’d be more excited if I hadn’t heard that for years. 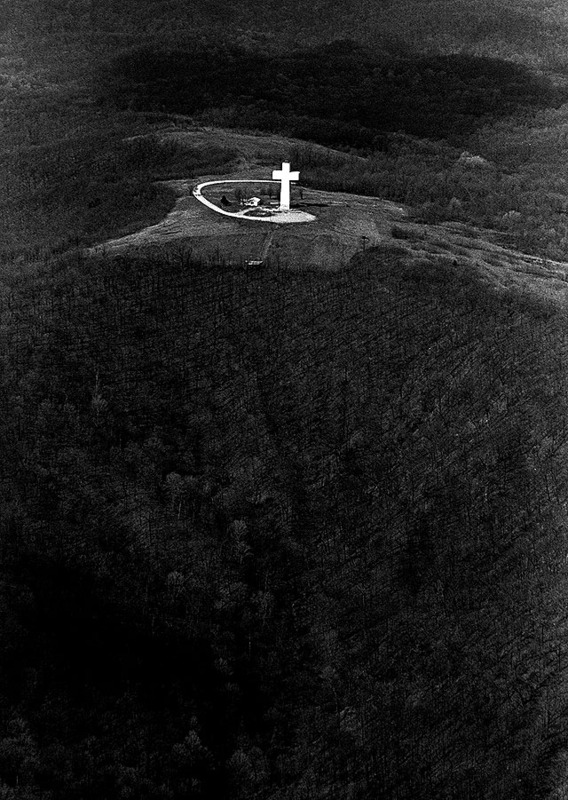 Still, the story jogged my memory that I had shot some aerials and ground shots of the Cross in the late 60s. I was pleased to see that the shot from the air was better than I had remembered. Parts of the film had deteriorated over the years, so my selection of pictures was limited. 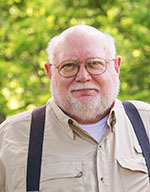 The project was spearheaded by Wayman Presley, who found 116 individuals who raised enough money between 1948 to 1951 to buy the land atop Bald Knob Hill. The foundation was poured in 1953. You can read more at the Bald Knob Cross web site. Financial shortfalls have been the one constant throughout the history of the Cross. The Bald Knob web site says that Presley quit his job with the Post Office to throw himself into fund raising. An appearance on This Is Your Life helped, but money was still tight. A challenge to supporters to raise pigs, sell them and turn the profits over to the cross raised $30,000. The formal groundbreaking ceremony was held in 1953. 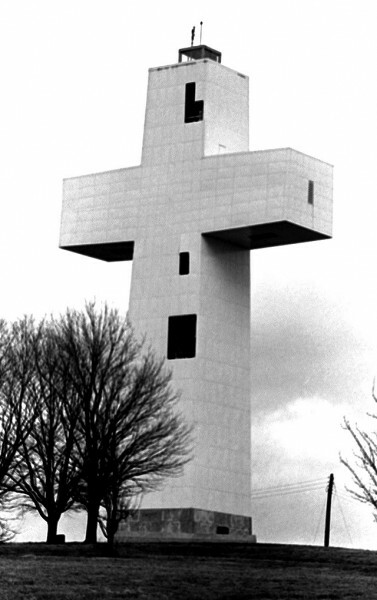 The bare metal framework of the Cross stood for several years until there was enough money to cover the superstructure with 900 heavy steel panels with a bright white veneer. The Cross web site said that 40,000 watts of lighting made the structure visible for 7,500 square miles. The Cross was supposed to be an interdenominational symbol of peace, but internal conflicts were growing at the same time as the structure was deteriorating. The disputes became so serious by 2006 the courts stepped in and locked down the properties until everything could be sorted out. In the summer of 2008 a settlement that was supported by both sides of the conflict began taking shape. In the agreement, all current board members would step down and the court would appoint a temporary transitional board comprised of mostly religious leaders in Southern Illinois. The final legal settlement became official on Christmas Eve 2008. The seven member transitional board met in the middle of January 2009 for the first time. Since that time, the board has been extremely busy. In addition to the obvious challenge of the physical restoration of the Cross, the organizational structure, fiscal policies and procedures, and program development aspects of Bald Knob have been addressed. Physical restoration of the Cross has already begun. 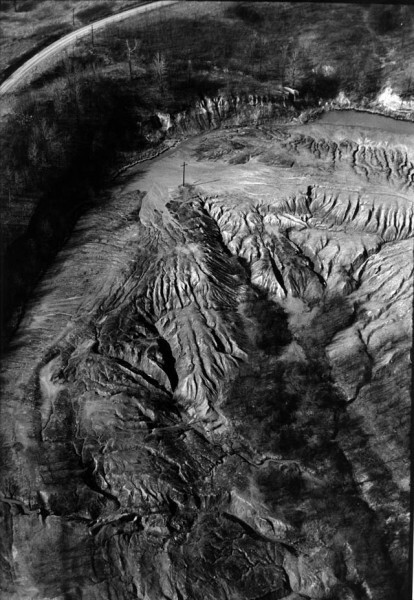 Wife Lila, who was looking over the page before I published it, remarked that the Bald Knob Cross reminded her of a photo I had taken of an abandoned strip mine in Southeastern Ohio in 1969. A power pole caught the late afternoon light just right to look like a cross. The picture ran almost full page in The Athens Messenger on the first Earth Day. It’s always been one of my favorite pictures. She was right. (Of course, that’s always the case. It goes without saying, but she like to hear me say it anyway.) I’ll let you decide. I have greatly enjoyed the pics and the stories behind them. You have a real talent for photography. These pics have made me homesick for Cape. After I met my husband I moved to Modesto, CA for about 10 years. In 1995 my husband was transferred to Shboygan, WI and we have decided to retire here. My maternal side of the family was from from the Scott City, Cape Girardeau, MO areas. Also the Elco, IL area. My Grandfather owned the only gas station in Elco. It was two of those hand pump or crank kind of gas pumps with the glass top. I remember when I was younger that he said pump it to the “3” and that’s a dollar. I have greatly enjoyed the pics and the stories behind them. You have a real talent for photography. These pics have made me homesick for Cape. After I met my husband I moved to Modesto, CA for about 10 years. In 1995 my husband was transferred to Sheboygan, WI and we have decided to retire here. Our parents use to take my little brother and I to the cross for Easter Sunrise Service. It would just send cold chills up our spins, even though we were young. I have never forgotten the old cross and hope to go there someday to see it again. Looking at the photos make me read more about it.Thanks for sharing this information.I would love to be in that place take and take photos. The restoration is indeed happening……today, August 8,2010, and next weekend, August 14, 15, weather permitting, the cross is open for tours to the top for a $20.00 donation. Must be 18 years old. The view is spectacular and the opportunity is unique. Once the skin goes on the cross the chance will be gone. 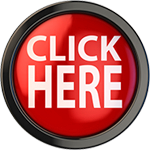 I like this post! its interesting and very informative, i am really enjoyed reading and watching the photos , thank you so much for sharing this very informative post and keep it up! How wonderful that you were able to share these pictures! Something made me think when I read how important the cross is, and someone wrote a book, “When The Crosses are Gone”, showing how important they are and the significance behind them, in preserving America. What i don’t realize is actually how you are now not really much more well-liked than you might be now. it is one thing to do with Woman gaga! Your personal stuffs outstanding. Previous PostPrevious Where’s the Ware Cemetery?